Let’s face it most of us are computer geeks who have multiple hard drives just sitting around doing nothing. Some of us use of hard drives backup and some of us have yet to find a use for them because installing them back into our computers takes time. Luckily hard drive docking stations have been around for years. I have had the fortune to review several different brands over the past three years. 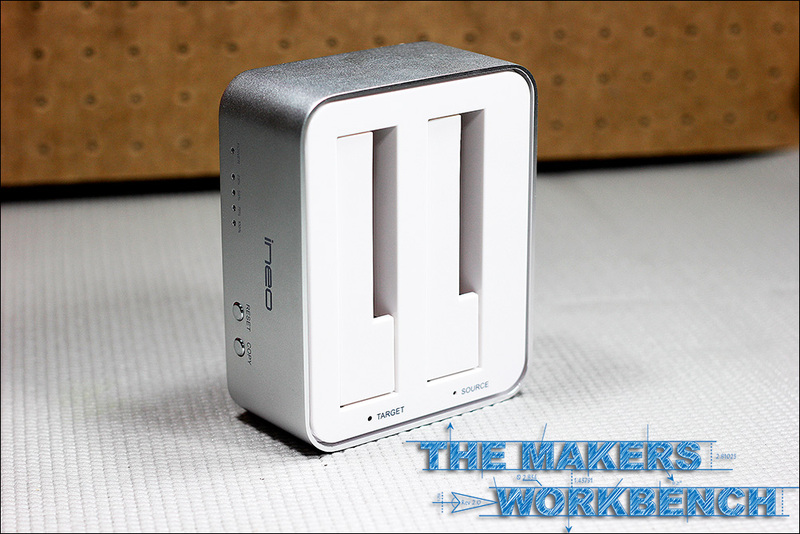 Today I’m going to take a look at the I-NA321U+, which is by far the most impressive hard drive dock I have reviewed to date. 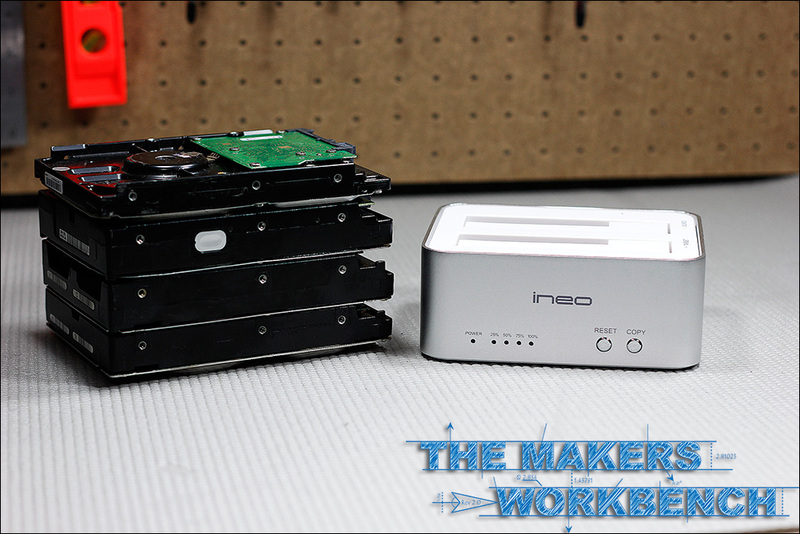 INEO is no stranger to the world of storage solutions they have brought us innovative products such as USB 3.0 PCI-E cards, unique external hard drive enclosures, NAS Units and storage solutions to protect our unused hard drives. 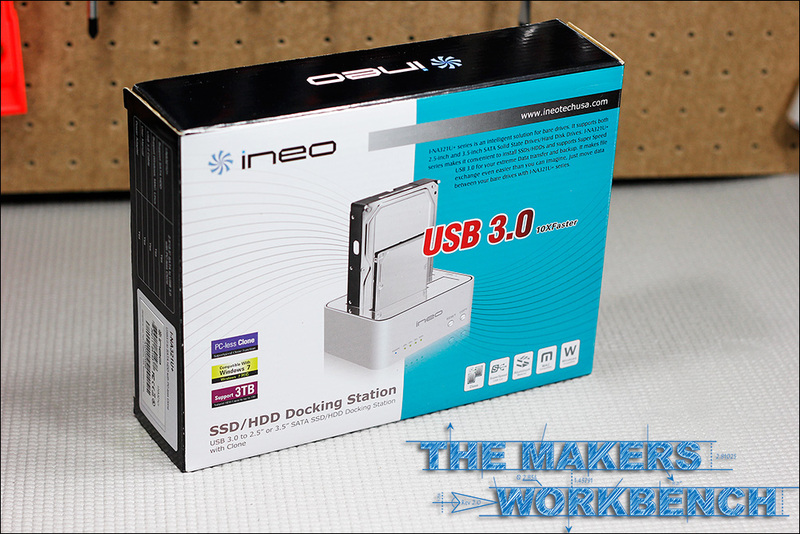 The I-NA321U+ is their latest offering in their desktop hard drive docking solution lineup. It is however, not your typical two bay hard drive docking station as it features PC-les hard drive cloning capabilities. The build quality of the I-NA321U+ simply blew me away! 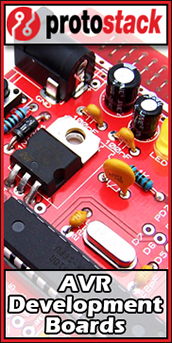 The outer body is constructed of aluminum that is about 1/16 of an inch thick, with the top being constructed of ABS plastic. The unit as a whole feels heavy in the hands, which means it will not slide off your desk easily. Having a heavy base is also good because large hard drives tend to raise the center of gravity and I have in the past seeing cheap light weight hard drive docking stations fall over when a big hard drive spins up. I placed a 2 TB Western Digital hard drive into the back slot and turned the dock on to see if the hard drive spinning up would make of the dock wobble. I’m happy to report back that everything stayed firmly in place. One of my big issues with USB 3.0 is that the USB cables never seem to sit securely into their female receptacles. This is mainly an issue on units that use the Mini-USB 3.0 connector but I have seen it happen on devices that use the larger USB 3.0. A loose / flimsy connection is not the case with the I-NA321U+ as the cable seems to fit quite snugly into its female counterpart. 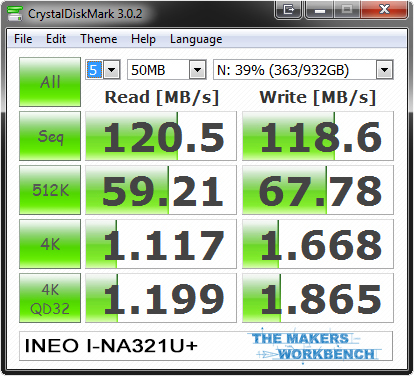 Tests Ire performed with the motherboards built-in USB 3.0 ports and unlike most reviewers, I chose not to test with the fastest hard drive on the market. I feel this skews the results that the average consumer will see because not everyone owns a 10,000 RPM HDD or cutting-edge top-of-the-line SSD. 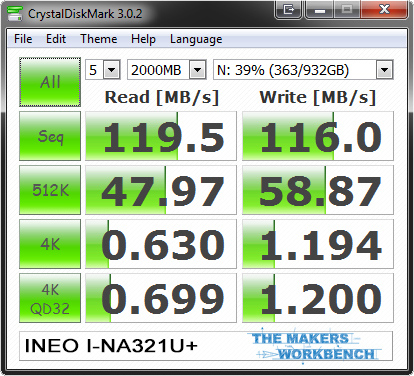 I chose to use a simple 1 TB Hitachi Deskstar 7200 RPM midrange hard drive. 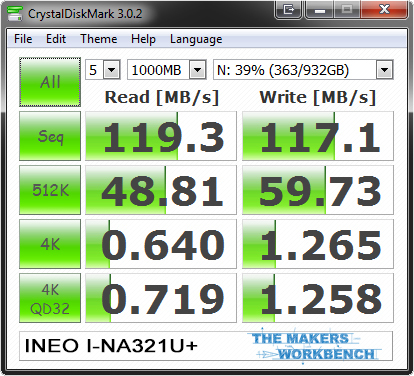 For hard drive performance testing I like to use Crystal Disk Mark as it seems to be industry-standard. 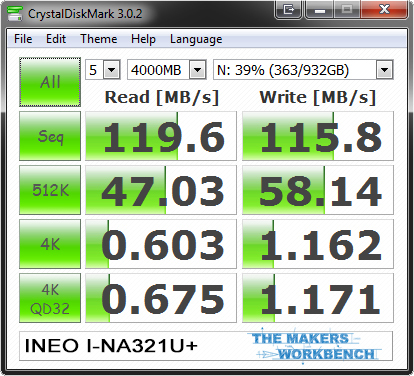 As a whole the I-NA321U+ performed exceptionally Ill at all data block sizes. 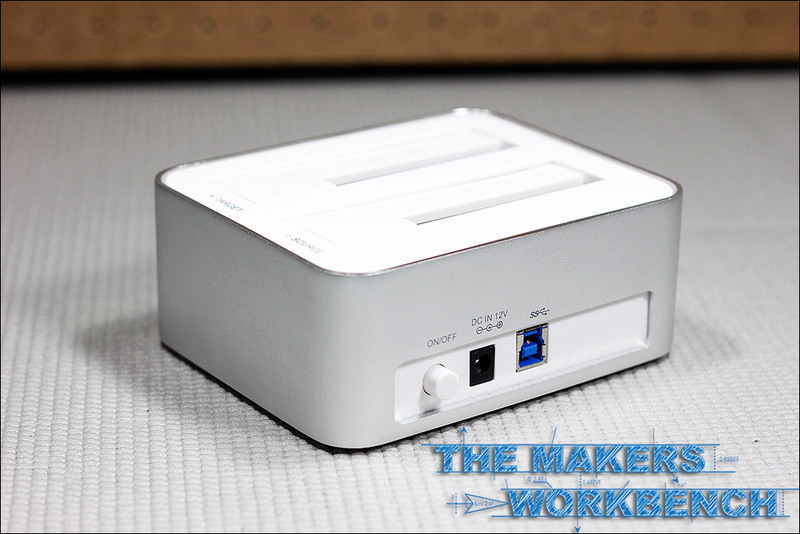 It was by far the fastest hard drive docking station I have reviewed to date. I only ran the data sets once each as I feel that running them multiple times and averaging the results to get a 0.10 difference is moot. I understand that averaging the data produces a metric of the average speed that consumers might see over time but to be honest even a 1.10 difference is not going to be noticeable. 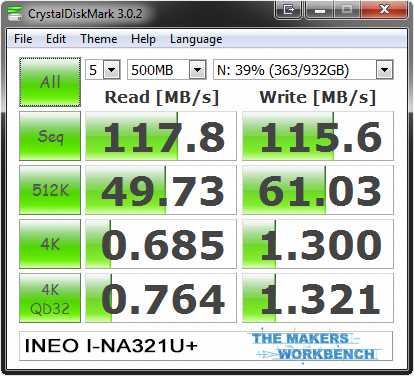 I also tested the I-NA321U+ drive cloning feature. Unfortunately however my camera was broken and at Canon’s repair center during this process and I have no photos to show you. I copied an Ubuntu Server install from 120GB SATA Drive to a 360GB SATA drive. The process took about 45 minutes and I are happy to report that the clone drive works flawlessly. I am sure the process will work just as easy when cloning over a Windows installation. 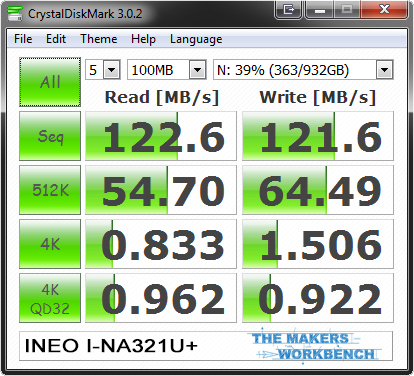 The I-NA321U+ was by far the nicest hard drive dock I have tested to date. It’s solid construction and heavy feel makes it feel like it should be at a much higher price point than INEO has placed it at. Aesthetically the I-NA321U+ is quite pleasing to the eyes. 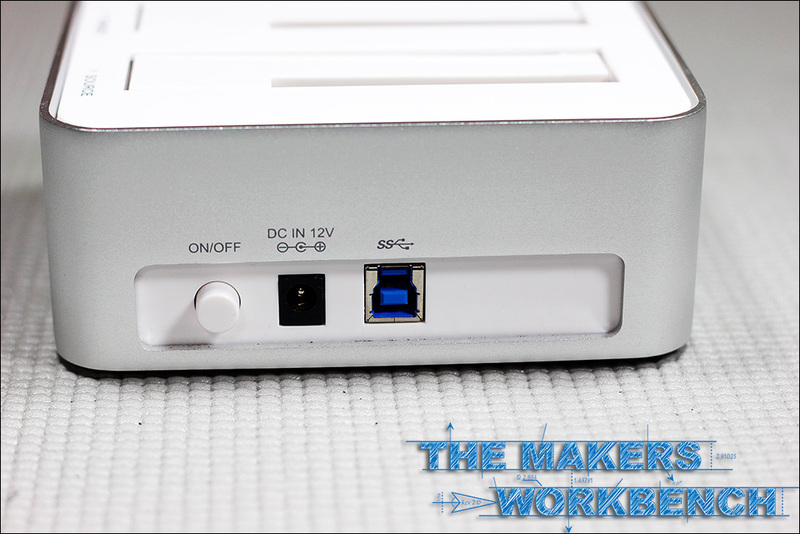 The docks anodized aluminum body and white abs top will complement your desk’s color scheme whether you’re a Mac or a PC user. I have used the drive over the last month and a half, and transferred Ill over a terabyte of data using it. Not once has a transfer failed or an error occurred. It has even helped me recover data from a failing hard drive. Transfer rates of her long transfers have been above average and really seem like there is minimal speed drop over the duration of the transfer. The PC-less cloning feature really pushes this hard drive docking station into a class of its own. I can see this dock being a major productivity improving tool at PC repair shops around the country. Over-clockers, hardware testers, and power users in general will find this feature immensely useful, and if you’re just a normal everyday user I are sure that this feature will come in handy at some point. For the most part I will be using this as part of my data backup system where I backup all my data and store it off-site in a secure location. 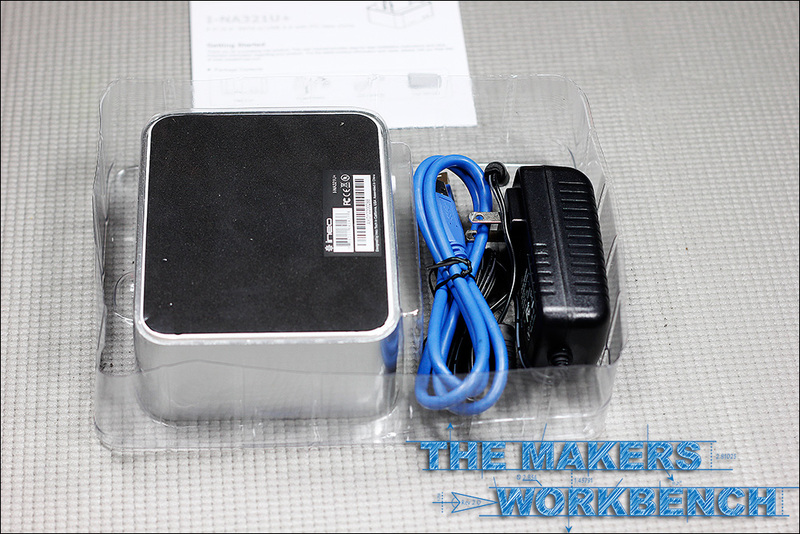 The I-NA321U+ is the perfect solution for those looking to put those unused internal hard drives to use. 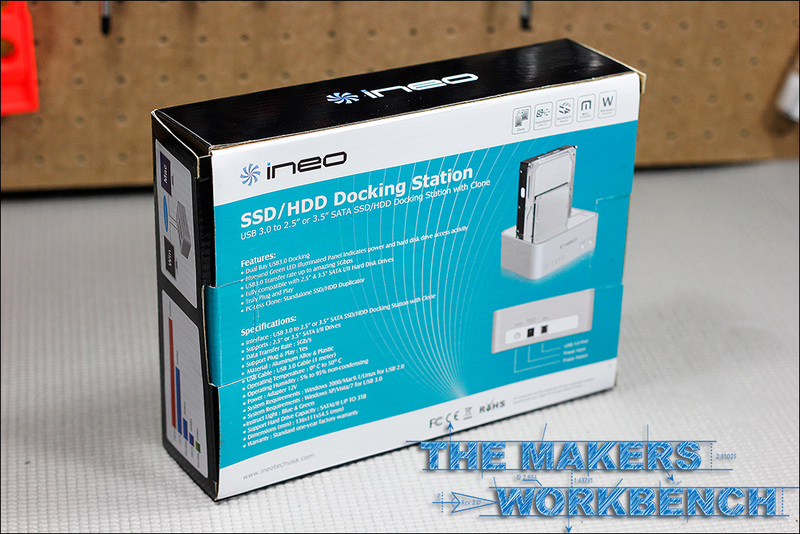 I recommend the I-NA321U+ to anyone seeking an internal hard drive docking station. 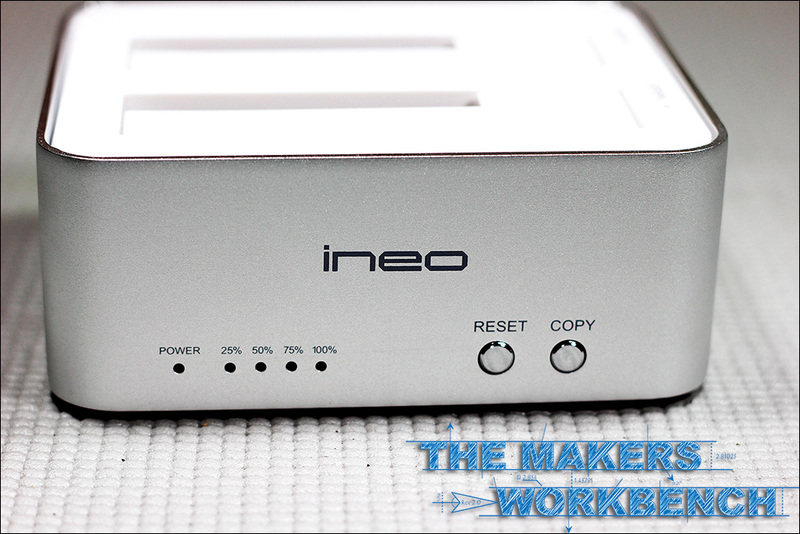 The INEO I-NA321U+ thoroughly impressed me. I honestly went into the review expecting another run-of-the-mill hard drive docking station but what came out of the box simply blew me away. 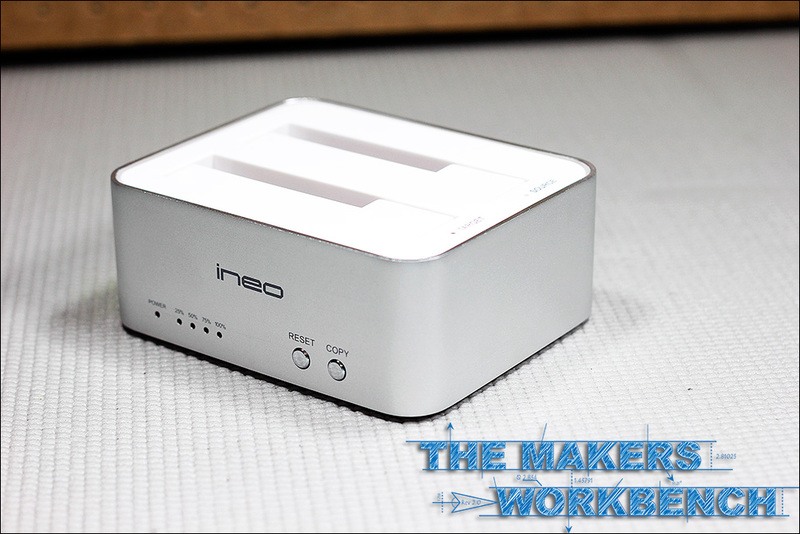 As a result the INEO I-NA321U+ will be the first review product at TheMakersWorkbench.com to receive a perfect score of 100. I have held onto this review a few weeks longer than I should have trying to find a flaw, and at this point I have found nothing to knock points on. 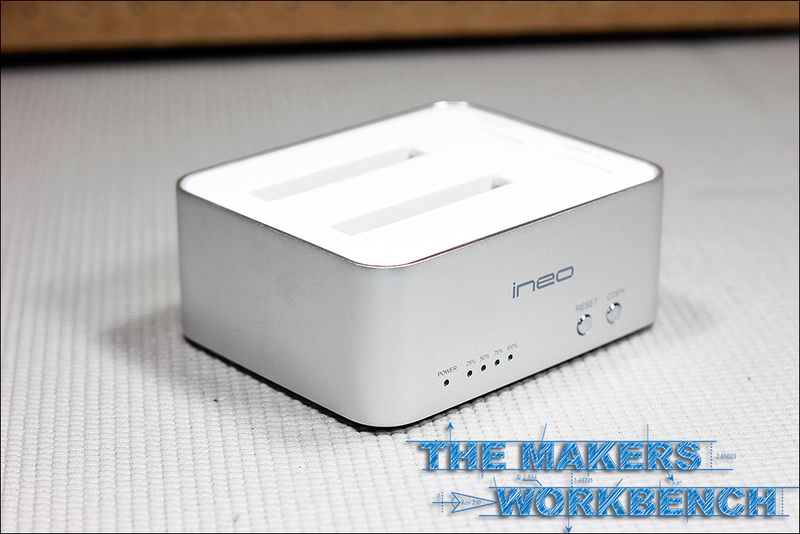 INEO hit a major home run with the I-NA321U+.